In October, US President Donald Trump threatened to withdraw from the 1987 Intermediate-Range Nuclear Forces (INF) Treaty, which bans all land-based missiles with a range of between 500 and 5,500 kilometers (310 miles to 3,400 miles). After the NATO foreign minister summit in Brussels on Tuesday, the military alliance came out on Washington's side and also accused Russia of breaching the INF treaty. The US has given Russia a 60-day ultimatum to comply with the treaty. Otherwise, the US will abandon the INF agreement for good. The dispute centers around the Novator 9M729 missile system, which carries the NATO designation SSC-8. The US has recently shared its intelligence on the weapons system with NATO. Several media reports have also shed light on the Russian weapon. In late July 2014, The New York Times first broke the news that Washington had a suspicion Russia might be violating the INF treaty. It said that the then president, Barack Obama, had sent a letter to his Russian counterpart, Vladimir Putin, on the matter. The paper claims Russia began testing the new missile system as early as 2008. The New York Times also reported the Obama administration had hoped to reach a compromise with the Russians by not publicly accusing them of violating the INF agreement. On Tuesday, the US State Department said five confidential talks between arms experts had been held since 2014 over the missile system. Yet it claims Russia had denied, concealed and spread lies about the new missile. The Trump administration then went public with the name of Russia's new missile system that allegedly violates the INF treaty. On November 29, National Security Council official Christopher Ford announced at Washington's Wilson Center that Russian missile manufacturer Novator had created the new 9M729 weapons system. Novator, which belongs to Russian state-owned arms company Almas-Antei, has in the past developed Russia's sea-launched Kalibr cruise missile, and a state-of-the-art nuclear-powered intercontinental missile. There are barely any technical details available about the 9M729 missile system and its development. US Director of National Intelligence Dan Coats was the first to provide technical specifications of the weapons system in late November, saying that Russia began developing the missile in the mid-2000s. Novator had reportedly been tasked with creating a weapons system "with great similarity" to missile systems under development at the time, such as the tactical road-mobile Iskander missiles, which can carry both conventional and nuclear warheads. 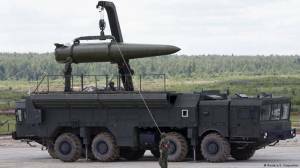 The ballistic Iskander missile and guided Kalibr rocket could have served as the basic model for the new weapons system. Coats said Russia had run an elaborate missile trial program until 2015. The INF treaty does allow for certain mid- and long-range missile systems to be tested on land, provided they are designed for use in the navy or air force. Coats claims Russia used this INF clause to hide the real purpose of the 9M729 missile system. "If Coats' account is accurate, then it is evident Russia tried to conceal its attempt to test a land-based missile for a range prohibited under the INF agreement," said Russian journalist and military expert Alexander Golz. He believes the US claims are plausible. 9M729: A direct threat to Europe? US authorities have not named the 9M729's official range but they are convinced the rocket violates INF provisions. Steven Pifer, a disarmament expert at the Washington-based Brookings Institution, shares this view. "I would doubt the Russians would violate the treaty just to develop a missile that slightly exceeds 500 kilometers in range," Pifer told DW. "I once gauged its range at 2,000 kilometers but that was just an estimate." Washington believes the new missile system could be ready for deployment. In February 2017, The New York Times reported on Russian units equipped with new missile systems operating at Russia's Kapustin Yar rocket launch and development site near Volgograd, and at another unnamed location. National Intelligence Director Coats confirmed that several units had been detected, warning that they pose a "direct threat" to most of Europe and parts of Asia. US observers have said that these rockets are very similar to existing weapons systems: they are compact, mobile and difficult to trace. In December 2017, Russia's Foreign Ministry spokesperson, Maria Zakharova, for the first time admitted the existence of the 9M729 missile system. But she said no weapons systems violating INF provisions had been developed or tested. Responding to NATO's recent accusations and the 60-day US ultimatum, Zakharova insisted Russia is fulfilling all contractual obligations.